The above is not a motto from the English primary school of my youth. It is a verse which, in the days when Britain exercised its authority over that country, used to hang in every National School in Ireland. The placement of this missive was an integral part of the avowed policy of National School administrators; namely the suppression of Irish identity by the teaching of English ideals and values in the tongue of the English. A great many apprentice Anglophiles had their native language literally beaten out of them under this regime. Not surprisingly, the propagation of Gaelic, as an instrument of ethnic awareness, and the necessity of isolating it from the profanities of English, has been a topic of concern to Irish administrators ever since. Just this once, I am cast adrift without a parachute. The entire booklet has been written as Gaeilge, except for a one-page résumé of the life of its subject. To make matters worse Labhrás Ó Cadhla, a singer of considerable historical as well as musical importance, was from the Waterford Gaeltacht, a region whose song tradition has had rather less publicity than, say, Conamara. The imbalance of status which results from this has compounded the problem further, since dictionaries of Irish are usually in the standardised form of the language. For those who may not know, Gaelic as a living language nowadays exists in several regionally defined and highly distinctive dialects. I have been told, and I have no reason to doubt the assertion, that the high standing of the Conamara singing tradition led to the dialect of that region being used as the model for standardised Gaelic. Whether that is true or no, Waterford Gaelic seems to be out on a limb of its own. Deciphering it via a foclóir is like to trying to unscramble broad Yorkshire with the aid of the Standard Oxford Dictionary. So - one stymied reviewer; one stone wall. The best way of breaching a hole in it, the wall I mean, would be to retail a little of what that résumé tells us. 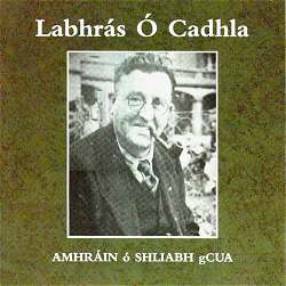 It says that Labhrás Ó Cadhla was born in 1889 in Scairt na Draighní, and that he attended National School in nearby Kilbrien, close to where north west Waterford meets south west Tipperary. These facts are significant. They mean that Ó Cadhla is one of the few sean-nós singers available on record, whose genesis goes back before the turn of the previous century. It also means that he was born at a time when Gaelic was undervalued and under attack, not just from the British authorities, but also from elements in Irish society who regarded the language as an unsavoury anachronism. For that matter, he was in a location which must have been on the outer fringes of Gaeldom. As the crow flies it is only about ten miles from Kilbrien to Clonmel where, information tells me, Gaelic died out some half century before Ó Cadhla was born. I am reasonably familiar with that part of the country and know it as a sparsely populated region of superb natural beauty, possessed of some very climbable mountains. I suspect that the ingress of English into that part of the world would have continued much further and faster, were it not for the sudden sharp rise of the Comeragh mountains on leaving Clonmel. It would also have continued further and faster if the rulers of Ireland had had their way. The verse I quoted above would certainly have hung in Ó Cadhla’s classroom and Ó Cadhla was to recall in later years being punished for singing songs in his native language. What kind of mark did the punishment of the boy leave on the man? Unfortunately, I have no information on the psychology of Labhrás Ó Cadhla. However, I always understood that he became a National School master himself, presumably after the abandonment of anti-Gaelic strictures. Such an occupation would not be rebutted by the booklet’s numerous photographs. They uniformly show a stocky, middle-aged man wearing a three piece suit. He is for the most part somewhat unkempt in a manner which only certain schoolteachers seem able to achieve. The résumé makes no mention of this, but tells us that he was employed as a travelling teacher of Irish by Conradh na Gaeilge (The Gaelic League) and that he taught classes throughout Waterford and Kilkenny. It also mentions that he learnt songs from his mother, from an elderly aunt, and from some of the older Irish speakers in his neighbourhood. The suggestion I’m getting from this is that, by the time of Labhrás Ó Cadhla’s youth, the Irish language in his part of Waterford was on the way out and spoken mainly by the older generation. If so, then I am left conjuring a rather singular figure; someone who was more of a revivalist, consciously preserving the language and music and traditions of a heritage soon to disappear, than the natural inheritor of a living tradition. The presence of the Gaelic League, as a backdrop to the scenario, tends to strengthen my impression. The Gaelic League, which was founded four years after Ó Cadhla was born, was a proselytising organisation, with a mission to remove from Ireland all traces of English culture. By re-educating the populace, its members hoped to completely reverse the sudden and savage nosedive which Irish went into in the latter half of the nineteenth century. A region on the fringes of Anglicised Ireland, with a declining population of Gaelic speakers, is exactly the sort of area where I would expect them to focus their resources. A conscious revivalist, steeped in the Gaelic lore and traditions of his native region, is exactly the sort of person I would expect them to employ. Was Ó Cadhla from a proto-nationalist family perhaps? I know not. However, I am intrigued that a Cormac Ó Cadhla was actively collecting Gaelic folksongs in south Munster in the early years of this century, and the thought occurs to me that he might have been a relative. Be that as it may, the reason I have entered this discourse is because I am not sure what to make of Labhrás Ó Cadhla. I love the disc, but where does he fit in to the mosaic of the sean-nós? Let me say at once that he does not sound like a typical Gaelic revivalist of the era. In its early years, the Gaelic League attracted quite a number of singers who were urban and middle class and sang their songs in a polite and starchy manner. At best they could do no more than approximate the roughness and passion which hallmarks all truly great sean-nós. A friend of mine once described such singers as pasteurised. By that I think he meant they had been clinically treated. Well, Ó Cadhla’s singing is full of satisfying rough edges, but his style does not conform to what most people would nowadays think of as archetypal Waterford. That is because his reputation as a sean-nós performer has been overshadowed by Nioclás Tóibín, a man four decades younger than he. So great was Tóibín’s influence, that he left his imprint on virtually every Waterford singer who has come along since. He has recently been the subject of a CD reissue and readers unfamiliar with the man might like to check what I said about him when reviewing the disc. In summary though, where Tóibín sang with a clear toned massive projection, high up the vocal range, Ó Cadhla’s voice seems hardly to travel past his lips. Where Tóibín sang in direct uncompromising rhythms, Ó Cadhla’s use of rhythm reminds me of nothing so much as a meandering mountain stream. Where Tóibín relied on sparse, regular ornamentation, Ó Cadhla’s is much more elaborate and less predictable. Only in the clear diction and open tone can I hear any basis for comparison. In fact, so individual is Ó Cadhla’s approach that, on first hearing his performance of Pilib Séimh Ó Fathaigh, I thought he was using a different tune to the one which Nioclás Tóibín sang, and which Séamus Ennis claimed he got from Ó Cadhla. He isn’t. In any event, this dissimilarity between the two singers is so striking that it cannot go unobserved and we would do well to offer an explanation. Gut feeling in fact suggests to me that Nioclás Tóibín was not a sole archetype of Waterford sean-nós, and that his identification thus is a function of Gaelic revivalism, and of changing attitudes towards the status of sean-nós. I’ll explain that more fully in a moment. In the meantime, if this singing does not remind me of Nioclás Tóibín, it does at times strongly recall another great legend of Irish song; Elizabeth Cronin of Baile Mhúirne, West Cork! That is surprising, since Scairt na Draighní is a lot closer to Tóibín’s home village than Baile Mhúirne. Nevertheless, a lot of mountainous country divides north and south Waterford, a fact which must have made communication difficult. One is tempted to speculate therefore whether Ó Cadhla represented the eastern extremity of a singing style which stretched from west Cork to the Comeraghs. I’m inclined to doubt this for three reasons. Firstly, such a superficial comparison of repertoires, as I have been able to carry out, does not support the proposition. Dáibhí Ó Cróinín’s newly published collection of his grandmother, Elizabeth Cronin’s repertoire, arrived just in time for me to ponder the matter. Of the nearly seventy Gaelic songs, fragments and macaronics, which Mrs Cronin was known to have sung, I could identify only three titles which appear to match up with songs on Ó Cadhla’s record. Against that, of thirty-two different songs sung by Nioclás Tóibín on various commercial records, no fewer than seven are found here. Secondly, geographic-determinist style delineations usually end up posing more problems than they appear to solve. To talk of a single Ulster style of singing, or a general Clare style of fiddle playing, or even of an archetypal Waterford style of sean-nós, is both to distort and simplify reality. Performance styles are almost invariably too individual to slot neatly into regional categories in the way that certain pundits predict. Finally, Ó Cadhla and Tóibín must have known each other. Ó Cadhla taught summer schools in Tóibín’s parish while the latter was growing up. The young stalwart must have been familiar with the older man’s singing, even if it failed to serve him as a stylistic model. If geography does not provide a convincing explanation, what other factors might we look for? Unfortunately, only one of these tracks shows Labhrás Ó Cadhla in his prime. It is the aforementioned Sliabh na mBan, a field recording made in 1928. As far as I can tell, for the sound quality is abysmal, it seems to show a more forthright singer. He was in his late fifties and sixties when the remaining recordings were made, and retired on ill-health. Indeed there are places on this disc where Ó Cadhla’s voice seems barely able to cope. It is possible therefore that a failing constitution forced him to conserve his talents. That might explain the lack of vocal projection. It does not explain the other stylistic differences. I think the most likely answer is that Ó Cadhla represented an older generation of singer. His style was moulded by different social forces to those which applied with Nioclás Tóibín. It is time to leave off speculation and look at the disc. It is composed entirely of Raidió Éireann field recordings, except for Sliabh na mBan. This was made by one Wilhelm Doegen, a German whose collection of Irish recordings is held at somewhere called the ‘Royal Iriah [sic] Academy’. The name of Wilhelm Doegen did not ring any bells with me and a search through my library failed to reveal his name. I did though uncover a comment in The New Grove Handbook of Ethnomusicology which says that ‘Only desultory efforts were made in the fields of collection and publication in the years between the wars’. That is true, if one ignores the efforts of the Irish Folklore Commission. However, this body was not constituted until 1935, and only then with slender funding, and a brief which extended to all aspects of folklore. In any event, desultory efforts elsewhere should make Doegen’s work all the more significant. Is it possible, bad sound quality notwithstanding, that some of his other recordings might eventually find their way onto commercial release? If so, they could unravel some of the things which puzzle me. For instance, I wonder whether 2RN, as Raidió Éireann was originally known, might have had a hand in Doegen’s recordings also. Séamus Clandillon, the station’s director, was a Waterford man and a staunch advocate of Gaelic tradition. Did Ó Cadhla broadcast in those early days of Irish radio? I know not, but small pieces of information like these could help clarify the picture I’m trying to form of the man. They may tell us something about his status as a singer, as distinct from his status as a travelling teacher of Gaelic. Three different collectors made the other recordings -there are thirty-two in all - on three separate occasions. The earliest were made in 1948 by Séamus Ennis, and they were followed nine years later by Ciarán MacMathúna, who recorded him at a fleadh in Dungarvan. The final session seems to have been carried out during one of Ó Cadhla’s summer schools by Breandán Ó Cnáimhsí in 1958. Incidentally, one of the recordings from that last trip, An fhaoileann, turns up here, and on an earlier RTÉ issue; Amhráin ar an Sean-Nós (RTÉ CD 185). Is this an unnecessary duplication, or did the producers not have any more usable material? It would be surprising if the latter were the case, for Labhrás Ó Cadhla seems to have been much in demand by collectors. As well as the three Raidió Éireann sessions, and Wilhelm Doegen’s, he was contacted on several occasions by the Irish Folklore Commission; in 1940 by Liam de Noraidh, again while the singer was on summer school, and in 1948 when he was met by Kevin Danaher in Dublin. The photograph shown here was taken by Danaher and it appears on the inside front page of the CD booklet. Finally, graphic evidence also suggests that he kept a close link with Séamus Ennis. Another photograph featured in this article was taken by Ennis around Christmas, 1942. The tracks are ordered chronologically, except for Sliabh na mBan. This appears between the 1948 and 1958 items, presumably to prevent would-be purchasers from being put off by the merciless crackle. I can detect no vocal deterioration between Ennis’s visit and those of MacMathúna and Ó Cnáimhsí. However, the 1948 tracks are markedly inferior to the later ones in terms of sound quality. It’s like listening to a record of early Louis Armstrong; one which has been sequenced chronologically to span the gulf between acoustic recording and the introduction of Joseph Maxfield’s vastly superior electrical process. Subliminal playing, but, my God, the relief when one reaches the threshold of the electrical era! This surprises me, for there are other items of similar vintage among this series of RTÉ releases, and they sound nothing like as bad. Moreover, remastering is credited to Harry Bradshaw. He has done such splendid work, both for RTÉ and for his own Viva Voce label, that I am left wondering whether budgetary restriction in this instance limited the time available for restoration work. What did Labhrás Ó Cadhla sing about? For the most part, your monoglot guess would be as good as mine. However, while I regret the lack of translated texts, to say nothing of a proper introduction in English, it is necessary to gnash one’s molars in perspective. There are budgets and there are anticipated sales figures and RTÉ is not a specialist record label dedicated to the public propagation of an esoteric art form. It is the State broadcasting organisation. For RTÉ to release this disc at all, to say nothing of the other material with which they have so generously endowed us, would be like persuading the BBC to publish its archive recordings of Harry Cox, George Maynard and Sam Larner. Chance, as someone rightly said, would be a fine thing. Also, the booklet does appear to do some justice to the man. It contains a substantial introduction in Irish, which discusses his life and background in some evident detail, and which goes into those different recording sessions. The various tracks - Gaelic songs, local lore and English fragments - are transcribed and annotated. Finally, to demonstrate that the editor, one Pádraig Ó Cearbhaill, has done his homework, there is a substantial bibliography. Picking my way through that booklet, I was able to discover a number of clues as to song content. I am not going to mention Sliabh na mBhan again, except to tell anyone who doesn’t know already, that the song celebrates a famous battle of the 1798 rebellion, which was fought on the slopes of the mountain of that name. Instead, I will mention Sliabh Geal gCua na féile, a famous composition by the celebrated poet of that region, Pádraig Ó Miléadha. Here, I confess a most un-street cred addiction; Ciarán MacMathúna’s radio programme, Mo Cheol Thú. Listeners to that Sunday morning breakfast bonanza will have heard on more than a few occasions that Sliabh Geal gCua is a song of exile. It celebrates the premier mountain of Ó Miléadha’s homeland and he apparently wrote it while working as a coal miner in Wales. A translation of the song appears in Dermot Power’s Ballads and Songs of Waterford. How closely it mirrors the original, I am not here to argue. I can only say that it did not overly inspire me. However, that could easily reflect a lack of poetry in the translator, rather than the author. Whatever, Ó Miléadha clearly knew a fine tune when he heard one. It is sung to an air which listeners will recognise as a handsome variant of Seán Ó Duír a’ Ghleanna, aka After Aughrim’s Great Disaster. Seán Ó Duír a’ Ghleanna is a local melody around those parts, and a seemingly a popular one. Pilib Séimh Ó Fathaigh is sung to another variant. There are six other Pádraig Ó Miléadha compositions here, none of which I can pronounce on except for Mo Thig Beag Aerach (My Airy Little House). It is one of the songs featured on the Tóibín disc and readers may wish to look up my comments in the review. Incidentally, one of the Ó Miléadha songs featured here is called Rinn na nGael. That is the title of the Tóibín disc, but no song of that name is to be found thereon. There is also a pair of songs from another local writer, one Diarmuid Stokes. In An Pílear agus an Sáirsint, the poet seems to have had an altercation with a couple of members of the local Constabulary. If the title does not encapsulate the meaning - it translates as The Peeler and The Sergeant - there is a cry in the second verse which would seem to tell the listener everything. “Let me pass if you please!” If there is one thing the Irish are not short of it is songs about officious Policemen. His second song has a curious title; Caoineadh Dhiarmuid Stokes. This must surely be a lament by Diarmuid Stokes, rather than one to be uttered on his behalf. Whether or no, Ó Cadhla sings it like a funeral lament, his keening tones forcefully bringing to my mind the Donegal fiddler Neilly Boyle’s disobliging comment about funeral wailers: “You never heard such a hullabaloo in all your life”. The mournful impression is underlined by the eerie sound of the melody, and I was interested to note that it is used for another lament on this disc: Caoineadh Iníon Uí Mhuiríosa. Indeed, the curious melodic shape reminded me vividly of a famous record of keening from the Aran Isles. Was the present tune in common use among Waterford keeners, I wonder? Among the other Gaelic offerings, I was able to discern a meaning for Seán an Bhríste Leathair. It is, I discover, the song of a man who attributes his former success at courting to the beguiling leather britches he used to wear. How do I know that? Well, it is the one of the songs I was able to trace in the aforementioned collection of songs of Elizabeth Cronin. The disc has a couple of duplicated tracks. Cití na gCumman and Caoineadh Iníon Uí Mhuiríosa turn up among the 1948 recordings and again in 1958. That earlier session also furnishes the only piece of lilting on the disc; the jig, Páidín Ó Raifeartaigh. There are several pieces of prose which I cannot comment on, except to say that they appear to be bits of local lore, and they strengthen my impression of Ó Cadhla as a sort of local oral historian. Finally, there are two song fragments in English. Both have footnotes in Irish, which seems to me to be making an excess out of a principle. One of them is a single verse about a certain William Crotty. On referring to Power’s admittedly unscholarly book, I read that Crotty was a notorious Waterford highwayman of the mid-eighteenth century. Moreover, Power tells us, the song was sung in Irish in the Comeragh mountains up to the turn of the last century. Strange that Ó Cadhla did not appear to know it. The Avonree, the other English fragment, is a routine sort of a song, which celebrates the topography of the river of that name as it flows through Co Kilkenny. It is a dreary effort, choked with all the worst kind of Victorian conventions. Such songs are popular enough among the lineal descendants of the sanitised revivalists I mentioned earlier; those ballad singing competitors at fleadhanna cheoil, whose styles seem more suited to the drawing room than the peat shovel. Be that as it may, I can’t help but wonder why a fine Gaelic singer, immersed in the splendid poetry of his native song forms would bother with such a piece. I began this review somewhat mischievously by questioning the authenticity of the singing of Labhrás Ó Cadhla. At the risk of eternalising damnation, I would like to reverse the question and consider the authenticity of a later generation of singers. Indeed, I want to question whether a word like authenticity, or that phrase so beloved of those who don’t know; ‘the purest sean-nós’, can have any validity where this idiom is concerned. Earlier, I raised the possibility that stylistic differences between Labhrás Ó Cadhla and Nioclás Tóibín may reflect differences in attitude between singers of their respective generations. The hypothesis I’m coming round to is this. There is a limited amount of evidence to suggest a rift of styles between sean-nós singers of the late nineteenth and early twentieth centuries and those who came later. That rift cannot be adequately tested, at least not by me, because of the paucity of recorded material available. Nevertheless, I believe we can detect it, not just in this disc of Labhrás Ó Cadhla, but in the record of Róise Bean Mhic Grianna (RTÉ CD 178), in Elizabeth Cronin, and in certain Conamara singers, Colm Ó Caodhain for instance, and possibly Vail Ó Flatharta. Limited though the facts at my disposal are, I question whether the intervention of Conradh na Gaeilge, and resultant changes in consciousness among singers, might be key factors in procreating this rift. Before the founding of C na G, as it is nonchalantly known, bearers of Gaelic were not very worried about the fact that they spoke a ‘language which the strangers do not know’. They were far more concerned with the knowledge that the strangers were robbing them of all they had, and turning them out of house and home. Indeed, I wonder about the extent to which C na G defused a de facto class war by postulating a common Gaelic inheritance and a common Irish identity. Be that as it may, the incipient years of the organisation were spent in ‘ignorant good will’, as Yeats might have put it. Like me, the enthusiasm for Gaelic of most of their membership far outstripped their command of it. Their early meetings were usually held in English. Their entertainments more often than not seem to have consisted of recitals of songs by Thomas Davis or Thomas Moore. It is to the eternal credit of Conradh na Gaeilge therefore, that sections of the membership seem to have awoken early and fast to the importance, not just of the rediscovery of certain traditional arts, but to the need to preserve and propagate traditional modes of performance associated with those arts. Thus in 1901, well before Bartok started making cylinder recordings of Hungarian peasant singers, before Percy Grainger ever pointed one in the direction of Joseph Taylor, the London branch of C na G had purchased a cylinder recorder expressly to record and study London based sean-nós singers. It is a matter of considerable regret that none of the recordings have survived. Anyway, the effect of this awakening was that C na G began to encourage sean-nós singers to participate in competitions, at their annual Oireachtas and at locally organised feises. According to Dáibhí Ó Cróinín, the effect on the Baile Mhúirne singers was galvanic. From the founding of the Oireachtas in 1897, singers and storytellers appear to have poured into the Oireachtas from every Gaeltacht in the country. Moreover, he tells us, the Baile Mhúirne contestants were so successful that by 1900 Baile Mhúirne had become known as the capital of the Gaeltacht. This is hard to credit since C na G did not encourage competitions in sean-nós, until 1903. Even then, one can hardly imagine the whole Gaelic world going instantly ballistic. The Gaelic speaking regions of Ireland were geographically remote, socially isolated and poverty stricken. Travel, to the national event, or in some cases even to local feises, must have been an expensive and difficult undertaking. Moreover, one cannot imagine that the exertions of a middle class revivalist organisation would have been of much interest to them. What probably galvanised them in the finish was the prospect of big money prizes. I know not what the competition money was worth in those days. However, first prizes at the major Oireachtas events nowadays are in the order of several hundred pounds. One can imagine how a sum of that order would have grabbed the attention of a poor fisherman or farmer. The inducements did not stop there. Singers of Ó Cadhla’s generation would have been known and respected within their own communities, but the Oireachtas was a national stage. To receive the gold medal, which was the number one Oireachtas prize before it became superseded by the Corn Uí Riada, conferred national honour not just on the winner, but on the winner’s entire community. It put that community on the map, just as it put the singer on the map. Performers like Seosamh Ó hÉanaí, Seán ‘ac Dhonncha and of course Nioclás Tóibín were national figures, known and respected wherever Gaelic was spoken. The prize-winning singer at the Oireachtas was no longer a down trodden aberrationist, locked into a retarded culture. He or she was the living embodiment of all that was Irish about Ireland. With so much to play for, who would not be tempted to tidy their act up? Who would not conform to the judges’ expectations and pull their singing in, and use less eccentric rhythms and slides and ornaments, and stick to notes and intervals recognised in the world of European convention? Given the time scale I have suggested, it may be feasible that the world of the Oireachtas passed singers of Labhrás Ó Cadhla’s generation by; that he and others like him had already developed into mature stylists; and that it was left to an up and coming younger generation to adapt to the ways of Oireachtas judges. Whether or no, if Labhrás Ó Cadhla ever competed at the Oireachtas, I could see only one mention of that institution in the booklet’s infuriatingly small print and I was unable to discern its context. My feeling is therefore, that instead of acting as an instrument for the propagation of ‘authentic’ Gaelic singing, Conradh na Gaeilge became a force for mediation. It was the opinions of national judges, which set the seal on singing style, rather than the communally determined criteria which had earlier prevailed. If so, why did the average Oireachtas entrant display such powerful measures of individuality and passion? Why did he or she not end up sounding like those pasteurised fleadh competitors I mentioned earlier? The reasons are probably twofold. Firstly, the pundits within Conradh na Gaeilge clearly recognised that they were dealing with a living tradition, and one which obeyed its own rules. In seeking to understand those rules, and to incorporate them within judging criteria, they were probably more guilty of selectivity than of misrepresentation. On the other hand, Comhaltas Ceoltóirí Éireann, the body which administers fleadhanna cheoil, is first and foremost an instrumental music organisation. Its judges and administrators frequently have little experience of song, and almost no understanding of it as a living tradition. Secondly, like the judges, the entrants to ballad competitions seldom have much experience of living tradition. The majority are fairly urbanised and reasonably affluent. They do not know about Sarah Makem, or about Brigid Tunney, or even about Elizabeth Cronin, or what the ordinary folk of rural Ireland sang like. They only know that a sweet tone and masses of decoration, larded onto whatever the judges consider a ‘traditional ballad’, will get good marks. The essence of sean-nós singing, however, lies not in style but in feeling. Like the duende of flamenco, or the soul of great gospel singing, or the lift which characterises Irish instrumental music, the sean-nós represents an emotional response to the rigours of existence. As far as Gaeltacht inhabitants were concerned, neither the elevation of their language, nor the creation of an independent Irish Free State did much to alleviate those rigours. Therefore, money prizes and national status may have resulted in the reformation of singing styles, but they did not stop the singers from expressing what they felt. They merely found another way of doing it. All this is ancillary to the main business of the day; namely for me to recommend and for you to buy and enjoy. Bar room bores, Gael and Saxon alike, persist in assailing me with questions about how I can be moved by this stuff when I don’t understand the words. The answer is that the musical content, the emotion, the sheer raw humanity that is great sean-nós singing, transcends barriers of understanding and social culture in exactly the same way that flamenco does, or Tuvan throat singers do, or great singers of the Balkans do. No one in their right mind ever came away from a performance of Beethoven’s Choral Symphony complaining that they couldn’t understand the words. Nobody looks for logical language patterns in Mussorgsky’s Pictures at an Exhibition, or Dave Brubeck’s Miró Reflections. Who would ever grumble at the lack of comprehensible texts in the music of Michael Coleman or Willie Clancy? Louis Armstrong, an unpasteurised musician if ever there was one, is supposed to have said, “Don’t worry about why that brown cow gives white milk. Just drink the milk.” Yeahh! The verse quoted above can be found in Breandán Ó Conaire’s Introduction to Douglas Hyde; Language, Lore and Lyrics, Ó Conaire, ed. Irish Academic Press, Blackrock, 1986. Prohibitions against speaking Gaelic were enacted in Ireland as far back as 1366 and the infamous Statutes of Kilkenny. None seem to have actually carried the death penalty. There were however various lethal edicts directed against harpers and poets. Moreover, I would be surprised if a fair number of luckless Gaelic speakers did not find themselves strung up for saying the wrong thing at the wrong time. Rinn na nGael, Cló Iar-Chonnachta, CICD 104. See Séamus Ennis, Forty Years of Irish Piping, Free Reed FR 001/2. Ennis gives the air under its English translation, Gentle Philip Fahy. The Songs of Elizabeth Cronin: Irish Traditional Singer, Dáibhí Ó Cróinín, ed., Four Courts Press, Dublin, 2000. Rinn na nGael, ibid; the Gael Linn LP CEF 062 and two extended play records, GL6 and GL8. The New Grove Handbooks in Music: Ethnomusicology; Regional and Historical Studies, Helen Myers, ed., MacMillan, London, 1983. The section on Ireland is by Breandán Breathnach and Nicholas Carolan. Two songs credited to Labhrás Ó Cadhla are included in Ceol ón Mumhain, Liam de Noraidh, ed., An Clóchomhar Tta, Dublin, 1965. The Ballads and Songs of Waterford from 1487, Volume 1, Dermot Power, ed., Private Publication. Nd. From an RTÉ programme on Neilly Boyle, broadcast about the early 1980s. As far as I can remember, the interviewer was Séamus Ennis. Songs of Aran: Gaelic Singing from the West of Ireland. Recorded by Sidney Robertson Cowell. Ossian OSS 16. Most of my information on the early days of Conradh na Gaeilge comes from Reg Hall, Irish Music and Dance in London, 1890-1970: A Socio-Cultural History, University of Sussex, 1994, Unpublished thesis. See also The Gaelic League Idea, Seán Ó Tuama, ed., Mercier Press, Cork, 1972. See the section on Conradh na Gaeilge in The Companion to Irish Traditional Music, Fintan Vallely, ed., Cork University Press, 1999. Ireland: A Social and Cultural History 1922-79, Terence Brown, Fontana, Glasgow, 1981. This review by Fred McCormick was originally written in 2000 for Musical Traditions – www.mustrad.org.uk. See Seamus Ennis, Forty Years of Irish Piping, Free Reed FR 001/2. Ennis gives the air under its English translation, Gentle Philip Fahy. Two songs credited to Labhrás Ó Caladha are included in Ceol ón Mumhain, Liam de Noraidh, ed., An Clóchomhar Tta, Dublin, 1965.